With all of Zimmer's music, you are there, not at the concert but in the field. The main theme is inspirational, and is heard best in tracks three (on strings), six (with a male choir and Lisa Gerard), and especially track ten (as a joyous song celebration led by Lebo M with an African choir). Also impressive is the action piece heard in track nine, a relentlessly agressive epic that's preceded by a lovely and (much as I hate to use this cliched word) haunting orchestral prelude accompanied by Gerard's voice. 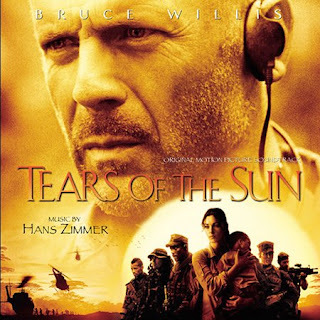 There are parts of "Tears of the Sun" that may sound harsh to the ears on a first listen, but this is an album that you can't help but appreciate and admire, whether or not you like it.